- How do i set it up again? 1: Close the top hole of the reservoir with the cork (make sure it's airtight). 2: Push the terra-cotta cone into the soil close to the plant (be careful not to damage the plants' root system). 3: Fill the reservoir with water through the neck and place it in the cone (a little water might spill while placing the reservoir, the plant is usually ok with this). - Why is there a hole in the reservoir if I cannot refill the reservoir through it? During the design process we made prototypes with and without a hole, and found that without a hole the glass reservoirs are extremely difficult to clean. Since we want you to be happy with your Waterworks-set for a long time, being able to clean the glassware is pretty important. After a while stains from calcium or algae can appear, and it would be a shame if there wasn't an easy way to get rid of those. We actually just pop our reservoirs (just the glass, not the terracotta or cork) in the dishwasher once-in-a-while and they come out squeeky clean, no hassle. 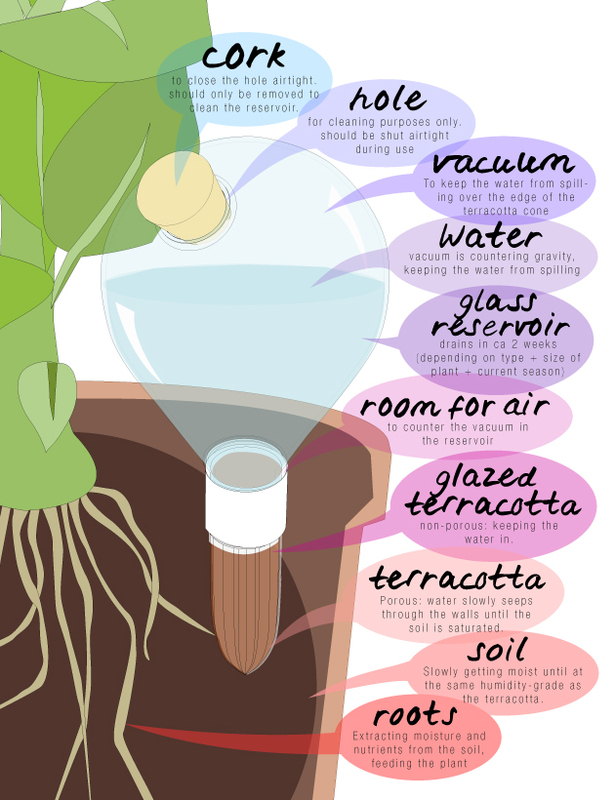 - How can i solve the issue of water spilling out between the glass and the terra-cotta cone. Ruling out you're accidentally pouring water in through the top hole (see above for how-to), this is usually a sign the cork is leaking air. Make sure the cork is closing the top hole of the reservoir air-tight by trying to blow into the neck of the reservoir. No air should be able to escape. This is extremely important as the working of the system depends on a vacuum in the reservoir. If there's no vacuum, gravity will have it's way and water will spill out the top of the terra-cotta cone. -I'm suspecting the cork i use is not air-tight, what should i do? By all means: get in touch. We use natural corks for the system, which means no two corks are alike and some might have holes and dips that we didn't spot during quality-control and that might make it difficult to close the top hole air-tight. That's why, in December 2014, we added an extra layer to the corks. After research and intensive testing, we decided on adding a small piece of shrink-fit tubing to each cork, eliminating the possibility of wel-hidden holes and cracks, while at the same time improving durability and stain-resistance. If you think your cork is not air-tight, please let us know (e-mail to home@houseofthol.nl) and we'll send you a new and improved cork. -I think the reservoir is draining too fast (within 1-2 days), what can i do? Most likely there's a problem with the vacuum in the reservoir: if the top hole is not closed correctly and air can still escape (even a little bit), the water will seep out between the walls of the terra-cotta cone and the reservoir at the same pace as the air seeping out the top hole. You can check if the cork is airtight by blowing firmly in the neck of the glass reservoir, no air should be able to escape. We're using natural corks, and although we check each one before adding it to a Waterworks-set, it is possible the natural irregularities of the cork prevent an air-tight closure. If you think this is the case, please let us know and we'll send you a new cork as soon as possible. -How long will i be able to leave my plant unattended? If you mean 'How long it will approximately take the plant to drink up all the water in the reservoir? ': Approximately 1,5-2,5 weeks. But: this is influenced by a lot of factors, not in the least by the type of plant, size of the pot, current season and the cone you're using. A lot of plants only need a little bit of water in Winter, and it might take over 3 weeks to see a significant difference in the water level of the reservoir. -I'm not noticing a significant difference in the water-level of my reservoir for a longer period of time. I'm afraid it's not giving off any water. First of: are you sure? Some plants really only need a little tiny bit of water and it can take up to three weeks to even notice a difference in the water level. Not so sure yet? A bit of (painters')tape to tag the waterlevel on the outside of the reservoir might show you if the water is indeed not seeping through. 1. The soil is saturated. The terra-cotta will only leak water if the surrounding soil has a lower moisture-content. 2. The cone is blocked: take out and rinse thoroughly in and out with running water. If needed you could use a little vinegar to get rid of scale. 3. The cone is not in direct contact with the soil: The system is based on the very natural relationship of moisture-levels in different materials. As stated above: the water will seep through the terra-cotta as long as the soil it's embedded in has a lower moisture content. The soil extracts the water, but in order to be able to do this, it needs to be in direct contact with the terra-cotta. That's part of the reason why the cone is ridged: to make the surface with which it connects to the soil as large as possible. (the other reason: strength). If the cone has been moved around a lot, what might have happened is that it's lost its connection with the soil (it's too loose): take out the cone, rinse, and replace on a different spot, of course making sure you're not damaging the root-system and the cone if firmly embedded in the earth. -The Waterworks-system seems to work perfectly, but still my plant is not happy, what should i do? First of all: make sure you're not over- or underwatering your plant. Maybe you should use a different cone? Secondly: sadly, water is not the only thing plants need to stay alive. Most plants thrive with the correct amount of sunlight or shade and need a bit of a boost once-in-a-while by adding some fertilizer (although some plants might hate fertilizer!). Also check to see if your plant is not placed in a draft or frequently brushed by a door or curtain: some plants are extremely sensitive to touch. Keep an eye on your pets as well: cats are notorious plant-destroyers. -I'd like to use Waterworks as a gift for my business-acquaintances and/or employees, is that possible? Get in touch for information about discounted prices and delivery times. Pop us an e-mail and we'll get back to you as soon as possible.